121 Marion, Iowa, Nov 5, 1923. On Nov 5, the Cary Club met with Mrs. Blinks. Fourteen members being present. The President called the meeting to order and the minutes of the last meeting were read and approved. Each member responded to roll call with a quotation from St. John. 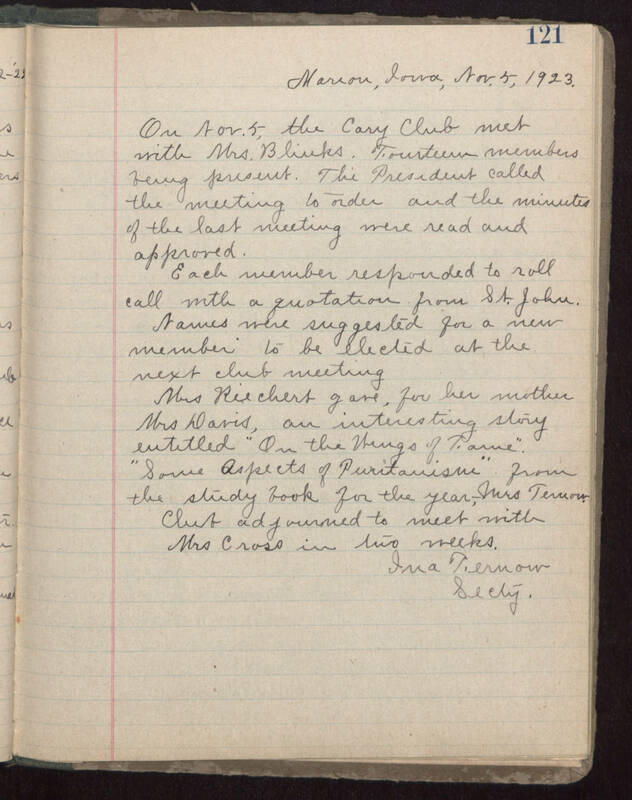 Names were suggested for a new member to be elected at the next club meeting Mrs Riechert gave, for her mother Mrs Davis, an interesting story entitled "On the Wings of Fame". "Some Aspects of Puritanism" from the study book for the year, Mrs Fernow. Club adjourned to meet with Mrs Cross in two weeks. Lina Fernow Secty.